Transnet National Ports Authority (TNPA) is one of five operating divisions of Transnet SOC Ltd. The National Ports Authority is responsible for the safe, effective and efficient economic functioning of the national port system, which it manages in a landlord capacity. The division provides port infrastructure and marine services at the eight commercial seaports in South Africa - Richards Bay, Durban, Saldanha, Cape Town, Port Elizabeth, East London, Mossel Bay and Ngqura. TNPA operates within a legislative and regulatory environment and is governed by the National Ports Act (Act No. 12 of 2005). TNPA is playing a key role in the South African government's Operation Phakisa: Oceans Economy initiative that aims to grow the economy through marine transport and manufacturing. Richard Vallihu, Chief Executive at TNPA, recently said: "Ports are a catalyst for economic growth. By opening up the Oceans Economy and redistributing the value proposition that the ports offer, to a wider range of role players and stakeholders, our ports are playing an incredibly important role in addressing the three scourges plaguing South Africa: unemployment, poverty and inequality." In order to address these issues and that of radical port transformation, TNPA is focusing on Smart People's Ports, Modernisation of Ports and Building Marine Capability, among other programmes. TNPA is embracing the 'Internet of Things' and pioneering digital projects in the ports that are in line with the Fourth Industrial Revolution. By harnessing the power of technology and applying this in the ports, the intention is to create communication platforms that enable sharing of information with a much wider audience. By raising awareness of port careers and business opportunities TNPA hopes to attract bright young minds and skilled entrepreneurs to be part of the radical port transformation journey. Modernisation of the South African Ports is another important aspect of Radical Port Reform. The Port of Durban has numerous projects underway to widen, deepen and lengthen berths and improve other port infrastructure, so that it can better cater to the needs of the global maritime industry, with its ever increasing size of visiting vessels. The KwaZulu Cruise Terminal, a joint venture between MSA Cruises SA and Africa Armada Consortium, has also been announced as the preferred bidder for the Durban Cruise Terminal worth R100-million. "It will be another asset within our Radical Port Reform that will create more opportunities by opening up our port to private sector partnerships and the communities in which we operate‚" said Vallihu. At the Port of Richards Bay, TNPA is looking into procuring a flexible ship repair facility through the private sector. This would allow the industry to identify opportunities in oil and gas support, ship repair and associated marine manufacturing activities supported by the Richards Bay IDZ at the port. Potential sites for these projects are identified as the undeveloped Causarina area of the port and the repair quay. The current tug building project is part of the wider fleet replacement programme that covers tugs, new dredging vessels and new marine aviation helicopters - all of which falls under TNPA's R56 billion contribution to Transnet's R300 billion-plus Market Demand Strategy, or MDS, which is now in its fifth year. The tug building contract valued at R1.4 billion is the largest single contract TNPA has ever awarded to a South African company for the building of harbour craft. "If we improve efficiency and turnaround times, we can reduce the cost of doing business and we can begin to attract business from elsewhere," said Vallihu. One focus area for TNPA is in building its own intellectual capital by expanding its Research and Development capabilities. TNPA also want to ensure that it develops the competence within the local ship building industry to engineer and build a South African fleet, making use of world-class technology. 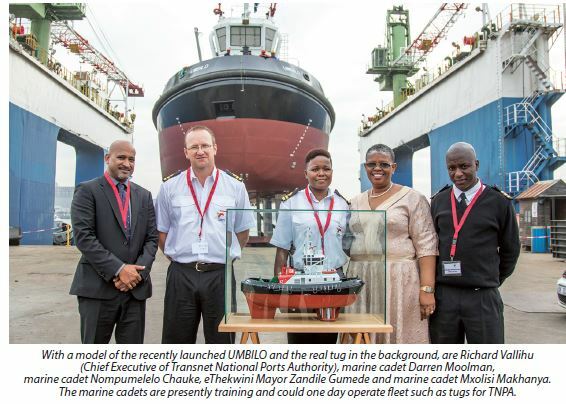 To further support this, TNPA is focusing on schools that will complement the Transnet Maritime School of Excellence. Transnet has set aside a recordbreaking R7, 7bn for training over the next 10 years. This will allow the skills development drive to continue, focusing on young South Africans, whom are being developed in various aspects of port and marine operations. These include the Tug Masters who will one day operate the brand new fleet of tugs currently being delivered and the Marine Engineers who will be tasked with ensuring that these tugs performs to optimal efficiency.